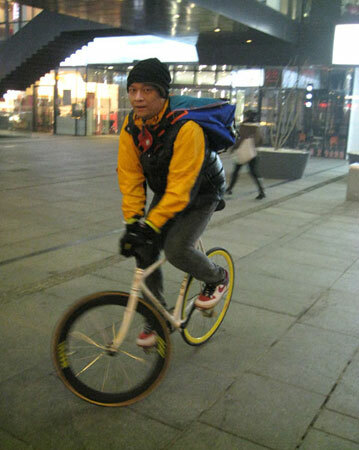 Hey what do Google, cheese, authentic consumer electronics, and now “fixed gear bicycles” have in common? They are all hard to come by in China. ‘It’s been a dream since I was a kid to get a bicycle like this,’ the 40-year-old fashion photographer told me. ‘But no one sold them here.’ It took nearly nine months, he said, to get a track bike he wanted sent from England in 2007. Someone throw a benefit show for these guys, already. That guy is clearly Mulato!